Jim and I own the FG 50 from Freedom Grill. We got it specifically for use with our Jeep Wrangler Unlimited. Boy, are we glad we did. Our Freedom Grill has actually come in handy more than we initially thought! At first, we thought we’d use the Freedom Grill for tailgate parties. Not necessarily for football tailgates, concert tailgates, or anything like that. More for those spur-of-the-moment occasions when we decide to tailgate at the last minute — like on a weekend camping trip or whenever we’re traveling off the beaten path around these parts (Middle Tennessee). Yep, we actually prefer the Freedom Grill to campfire cooking because it’s so easy to use, and convenient too. Plus, the cooking surface is large enough to prepare food for lots of people at once. Most recently, we used our Freedom Grill to cook for some friends who were helping us chop down trees on the property where our log home is being built. It was really convenient — and quick. 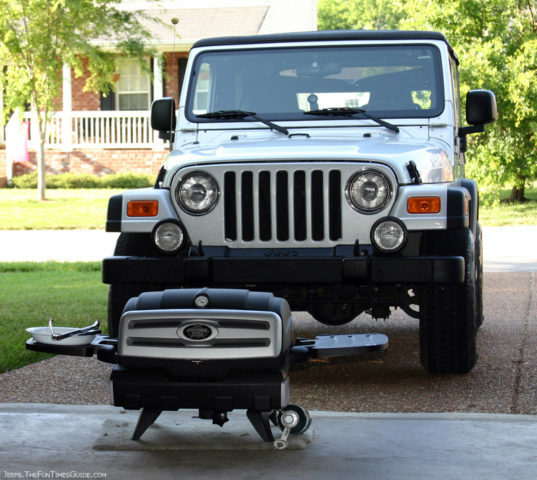 Just attach the heavy-duty swing-arm that comes with your Freedom Grill to your Jeep’s hitch (or any standard 2″ hitch receiver on any vehicle), lock it in place, then attach the Freedom Grill on top. It’s all very sturdy! The grill itself weighs 45 lbs. and the swing-out arm weighs 25 lbs. This is one heck of a solid set-up. The best part is you don’t have to put a heavy, greasy, smelly grill inside your Jeep. The grill is there when you need it, yet it’s not in the way. Freedom Grill makes a compact 1 lb. propane tank that’s easy to tote around — wherever the grill goes. We got that, and a Hidden Hitch hitch extender to allow for the spare tire on the back of our Jeep. We also got the grill cover from Freedom Grill that’s specially made for the FG50. But since we store the grill in our garage when it’s not being used, we found that we don’t use the grill cover as much as we thought we would. However, it’s still good when being used when you’re away from home — like when you’re on an offroad trip or a camping trip. It’s really large! It’s just about the same size as our backyard grill, and there’s a lot of cooking surface with the FG-50 Freedom Grill. I also like how there are 2 large flat surfaces on either side of the Freedom Grill that fold-out when you need them. They’re great for preparing foods prior to cooking, as well as for things like hamburger & hotdog buns, plates and napkins. There’s also a drop-down condiment shelf, too. And when it’s not being used to hold condiments, it serves as a cover for the knobs that power up the grill and adjust the amount of heat. This heavy-duty cover/shelf is made of the same durable material as the grill itself. Plus, it has “hooks” to hang your grilling utensils from! At the base of the grill are 4 sturdy feet which keep the grill raised slightly off the ground — great for when we’re storing it in the garage. But the slightly raised surface also makes it easy to use the Freedom Grill on a picnic table or on any other surface away from the vehicle. There’s a quick-release knob to quickly separate the grill from the hitch support pole. Plus, there are thick sturdy handles built into the sides of the FG50, so it’s easy to pick up and move this grill wherever you want. The heating element is quite good. It’s a strong steady heat that cooks the food quickly. When attached to the support pole on the hitch of your vehicle, the grill itself swings out 180-degrees for ease of use from all angles and to move it farther away from your vehicle while cooking. (Plus, you don’t want the heat from the grill going directly onto the back window of your Jeep… that could melt your Jeep’s vinyl windows!) Once you find the position you’re comfortable with, the grill locks into place on the swing-out support pole. Initially, I thought the Freedom Grill would just be a smaller, cheaper version of a “regular” grill. But no… this this is a powerhouse grill! It’s made of high-quality cast aluminum. And I prefer the black matte color of the FG50 better than the bright, shiny silver of the FG100 Freedom Grill which is made of stainless steel. The Freedom Grill FG 50 is less noticeable when you’re traveling around with it on the back of your vehicle. The entire grill is very solidly built and will last us many years, I’m sure. There’s nothing flimsy about the Freedom Grill — from the lid to the hinges to the hitch-mount support base that attaches to your vehicle. The Freedom Grill is a class act, inside and out. Freedom Grill states that the FG50 has a “3-year/ 36,000 mile limited warranty”. Last summer, our regular backyard grill went out, and it was time to buy a new one. Instead, we just used our Freedom Grill that entire summer (…and we grill a lot). You can use the 1lb. propane tanks that Freedom Grill sells for use with its grills. Or, with the Freedom Grill propane adapter, you can use a “regular” 20 lb. propane tank. Since we were using our Freedom Grill so much that summer, we got the adapter and used our own refillable propane tank. Jim went to SEMA (“the premier automotive specialty products trade event in the world”) last year where he met with Steve Glor, VP of Marketing for Freedom Grill. Here’s an example of Freedom Grill’s newest addition that might appeal to some offroaders: It’s a camo skin — for your grill! Check it out… this Nissan Titan was at SEMA’s trade show booth. 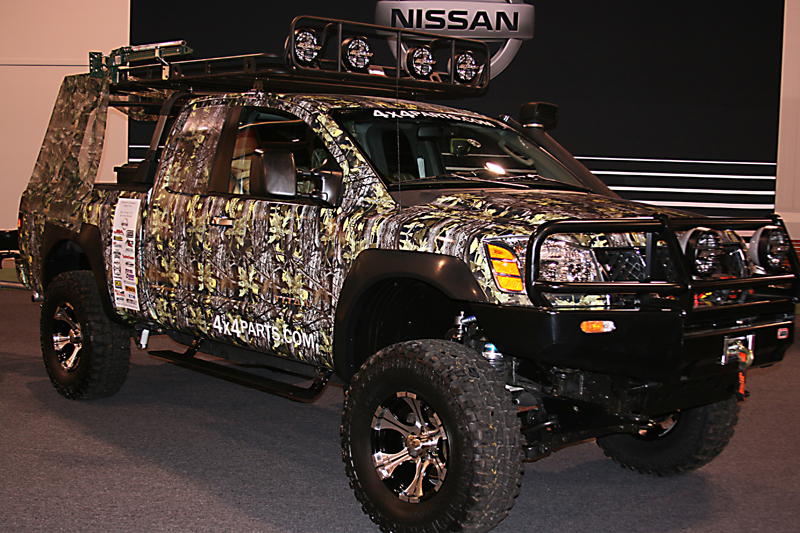 It’s outfitted with Realtree camouflage from head to toe, and it even has a FG-50 Freedom Grill with a camo “Grillskin”. Nothing says you’re a diehard hunter like a camo covered grill, right? Truth is, the Freedom Grill is such a cool grill for those who enjoy spending a lot of time outdoors, roaming out & about and exploring the backcountry roads — on and off-road. There’s actually a “cult following” for this particular grill! Just ask around, and you’ll see what I mean.